The temperatures on the surfaces of heat-sealed areas in liquid packaging bags made of laminated plastic films (e.g., nylon, polyethylene and linear low-density polyethylene) were measured to investigate the effects of temperatures of heat-sealing plates and film feed rates on the heat-seal quality of films in heat-sealed areas, which was evaluated on the basis of whether separation between heat-sealed films is present. Thermal images were taken immediately after heat sealing using an infrared thermography technique at heat-sealing temperatures in the range of 100 to 190°C and at film feed rates in the range of 10 to 20m/min in an automatic packaging machine. Following the tests, the relationships between the distributions of temperatures obtained from the images and the heat-seal quality, which was evaluated by observing cross sections of the heat-sealed area, were investigated. In addition, the temperatures of the heat-sealed areas were analyzed by finite-element analysis. The results revealed that the distributions of temperatures on the surfaces of the heat-sealed areas could be used to evaluate the heat-seal quality. The use of packaging bags made of plastic films is increasing yearly because such bags are lightweight, inexpensive and functionally excellent. Most packaging bags are difficult to recycle, and are thus used in the one-way mode only. As a result, plastic garbage has become a serious environmental problem. Flexible packaging bags consisting of very thin plastic films are used as one method for solving the recycling difficulty, since they not only facilitate the reduction of volume and thickness but can also be folded into compact volumes for easy recovery. The liquid packaging bag used for food-related liquid or paste is one kind of flexible packaging bag. Most of the liquid packaging bags are fabricated by heat-sealing laminated plastic films, which are made to adhere two or three films with a thickness of several tens of micrometers. Recently, high-speed bag production has been desired for economical reasons. However, the manufacture of bags at high speed reduces the reliability of the heat-sealed areas and causes the contents packed in the bags to leak from the heat-sealed area. Therefore, the relationships between the heat-sealing temperatures at different film feed rates and the adhesiveness of heat-sealed areas must be investigated before bag manufacture to prevent leakage. In addition, it would be desirable to investigate the adhesiveness of heat-sealed areas periodically at the time of manufacturing an actual liquid packaging bag. To date, the adhesiveness and strength of heat-sealed areas are mainly destructively evaluated by tension tests, impact tests and the observation of cross sections of heat-sealed areas (Futase et al., 1994a, 1994b, 1996; Umezaki et al., 1997; Aoki et al., 2000). If these evaluations can be carried out nondestructively, the time required for the evaluations can be reduced, and on-line evaluation will be considered possible. In this study, the temperatures on the surfaces of heat-sealed areas in liquid packaging bags made of laminated plastic films were measured by an infrared thermography technique and analyzed by the finite-element method to investigate the effects of temperatures of heat-sealing plates and film feed rates on the heat-seal quality of films in the heat-sealed area, the quality of which is evaluated on the basis of whether separation between heat-sealed films is present. Figure 1 shows the liquid packaging bags used in this study, which were made of a laminated film, and contained approximately 15ml of water. 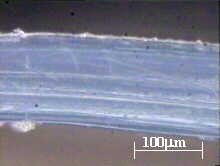 The laminated film consisted of nylon (NY), (15mm in thickness), polyethylene (PE), (15mm in thickness) and linear low-density polyethylene (LLDPE), (15mm in thickness), as shown in Fig.2. Three sides of these bags were heat-sealed by an automatic packaging machine (NT-Dangan, Nippon Seiki Co.). This heat sealing was called longitudinal and transversal heat sealing, and is represented by symbols "b" and "a" in Fig.1, respectively. First, longitudinal heat sealing was performed, and subsequently, transversal heat sealing was performed, while the bags were continuously filled up with water. The manufactured bags were continuously cut along the horizontal line passing through the center of the transversal heat-sealed areas. The transversal heat sealing is influenced by the feed rate of a film and the heat-sealing temperature compared with the longitudinal heat sealing, because it was carried out so that the water was pushed out. In this study, we treated the bags with the transversal heat sealing. Fig 1: Liquid packaging bag. Fig 2: Cross section of a laminated plastic film used for packaging bags. The film feed rates, v, used for manufacturing the liquid packaging bags were 10, 15, and 20m/min, and three kinds of temperatures of heat-sealing plates, which were called imperfect, best and foaming heat-sealing temperatures, at each film feed rate, T, were determined in the range of 100 to 190°C based on the results of preliminary heat-sealing experiments. The imperfect heat sealing was defined as when the adhesion between laminated films in a heat-sealed area is imperfect, the best one as when the adhesion is perfect, and the foaming one as when the adhesion is imperfect because foaming occurred in a heat-sealed area. The imperfect, best and foaming temperatures were T=100, 135 and 155°C at v=10 m/min, T= 113, 148 and 170°C at v=15 m/min, and T= 125, 160 and 190°C at v=20 m/min, respectively. The temperature of the filling liquid was 30°C. Thermal images were taken immediately after heat sealing at three kinds of heat-sealing temperatures at film feed rates of 10, 15 and 20m/min in an automatic packaging machine using an infrared thermography system (Radiance HS), by which thermal information in the 3 to 5mm infrared band can be measured and recorded. The main specifications of the system are listed in Table 1. Each image was taken at an interval of 1/30s and a shutter speed of 2ms. A thermocouple was used to calibrate the temperatures measured using the infrared thermography system. Following the tests, the time-series temperature distributions of the heat-sealed areas obtained from the images were investigated. Then, to investigate the relationships between the temperature distributions and the heat-seal quality, cross sections in the horizontal direction at the central part of the areas heat-sealed at v=20m/min and T=125, 160 and 190°C were observed using a microscope. Furthermore, a cross section at the position indicated by symbol "A" in Fig.1, at which it was difficult to obtain a good heat seal was observed using the microscope at each heat-sealing temperature and each film feed rate. Table 1: Main specifications of Radiance HS. Figures 3, 4 and 5 show the time-series temperature images of the surfaces of the heat-sealed areas obtained under the imperfect, best and foaming heat-sealing conditions, respectively. In these figures, the time immediately after heat sealing, at which a heat-sealed area separated completely from the heat-sealing plates, is expressed by t=0s; the black regions were assigned the value of T=30°C, and the white ones T=130°C. The regions changed from black to white as the value of T increased from 30 to 130°C. These figures show that the temperatures of the heat-sealed areas decreased with the slight progress of time, and the temperature distributions obtained under the foaming heat-sealing conditions were nonuniform. In particular, the temperatures at the foamed areas were higher than those at other areas. Fig 3: Time-series temperature images of the surfaces of heat-sealed areas obtained under the imperfect heat-sealing condition. Figure 6 shows the time-series temperature distributions on the surfaces of the heat-sealed areas obtained at the imperfect, best and foaming heat-sealing temperatures at v=15m/min as examples. The surface temperatures of the heat-sealed areas under the imperfect, best and foaming heat-sealing conditions were 70, 90 and 110°C, respectively, even if the film feed rate differed. Fig 6(a): Imperfect heat-sealing condition. Fig 6(b): Best heat-sealing condition. Fig 6(c): Foaming heat-sealing condition. Fig 6: Variation in temperatures on the surfaces of heat-sealed areas. The highest temperature along the right-hand end of the heat-sealed areas was at position P1, at which the least amount of time has passed after heat sealing among the three positions, and was the lowest at position P3, at which the most amount of time has passed after heat sealing among the three positions. The temperature of the central part was higher in the order, positions P5, P6, P4, though usually it was higher in the order, positions, P6, P5, P4. It was inferred that the temperature of the heat-sealed film at position P6, which was located along the edges of the heat-sealed areas and was heat-sealed in the earliest stage among the heat-sealed areas, was higher than that at position P5, which was located at the central part of the heat-sealed areas, because of the shock force produced when the edges of the rotating heat-sealing plates contacted the plastic films. In addition, it was inferred that the temperature of the heat-sealed film at position P5 was lower than that at position P6 because the heat-sealed film in the central part was cooled with water, which existed in the packaging bags between the heat-sealing plates. Figure 7 shows photographs of the surfaces of the heat-sealed areas. These results revealed that the photographs of the heat-sealed area surfaces obtained under the imperfect heat-sealing conditions cannot be distinguished from those obtained under the best heat-sealing conditions, though the presence of foaming can be judged from the photographs of the heat-sealed area surfaces by controlling the direction of light irradiation. 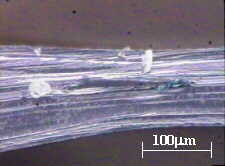 Fig 7: Photographs of the surfaces of heat-sealed areas. Figures 8 and 9 show micrographs of cross sections in the horizontal direction at the central part of the areas heat-sealed at v=20m/min at T=125 and 160°C, respectively. It was difficult to evaluate the adhesive quality of the films from these micrographs. 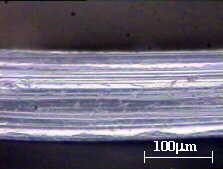 Fig 8: Photograph of a cross section of an area heat sealed at v=20m/min and T=125°C. 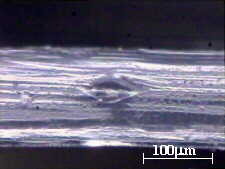 Fig 9: Photograph of a cross section of an area heat sealed at v=20m/min and T=160°C. Figure 10 shows micrographs of cross sections in the horizontal direction at a foamed part in an area heat-sealed at v=20m/min at T=190°C. These photographs were compared with the temperature distribution of the heat-sealed area corresponding to the photograph shown in Fig.10(a). 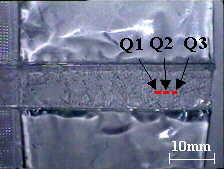 As a result, it was found that a cavity, which was considered to be a result of foaming and leaked filling liquid, existed in the middle of the thickness of the heat-sealed films at a portion with a relatively high temperature, as shown in Figs.10(b) and 10(d), and did not exist at a portion with a relatively low temperature, as shown in Fig.10(c). Therefore, it was confirmed that heat-sealed areas with cavities could easily be found on the basis of the temperature distributions obtained using the infrared thermography technique. Fig 10: Photographs of cross sections of an area heat sealed at v=20m/min and T=190°C. Figure 11 shows micrographs of cross sections of the heat-sealed areas at the position indicated by symbol "A" in Fig.1. These results revealed that the areas heat-sealed under the best heat-sealing conditions were completely adhered, and that those under the imperfect and foaming heat-sealing conditions were not partially adhered. These portions that had not been adhered corresponded to the portions with a relatively low temperature on the right-hand sides of the heat-sealed areas. Fig 11: Photographs of cross sections of heat-sealed areas at the position indicated by symbol "A" in Fig.1. It was confirmed that the difference between the adhesive qualities of the heat-sealed areas obtained under the imperfect and best heat-sealing conditions could be evaluated from the temperature distributions obtained by the infrared thermography technique, though it could not be evaluated from the photographs of the surfaces of the heat-sealed areas, as shown in Fig.7, and the micrographs of the cross sections of the heat-sealed areas, as shown in Figs.8 and 9. Heat sealing was considered as a plane strain problem. Figure 12 shows a two-dimensional analysis model, which has approximately the same shape and the same material properties as those for the experiments. Four-node plane strain elements were used. The number of elements was 1200, and that of nodes was 1407. The heat-sealing plates were expressed as rigid bodies. The temperatures of the heat-sealing plates and the film feed rates were the same as those used in the experiments. The analyses for v=10, 15 and 20m/min were carried out for durations of t=0.09, 0.06 and 0.05s, respectively. The stress-strain curve and Young's modulus of each film was obtained by tension tests. 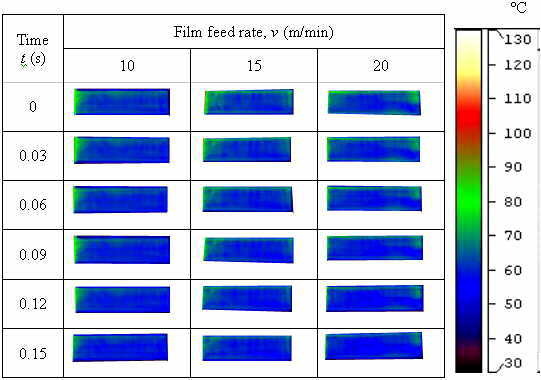 The thermal conductivity of each film was obtained by a laser flash method, and the specific heat of each film was obtained using a differential scanning calorimeter (DSC). The temperature dependability of the Young's moduli, thermal conductivities and specific heat values was taken into consideration. Figure 13 shows the temperature distributions on the NY surface located most distant from the thickness of the heat-sealed areas and in the LLDPE located in the center part of the thickness. The heat sealing was carried out at v=15m/min and T=148°C for a duration of 0.06s. In this figure, the horizontal axis x expresses a position from the left-hand end of the plastic films, and the right-hand end of the plastic films was at x=20mm. Fig 12: Analytical model : 1407 nodes , 1200 elements. The temperatures on the NY surface, which contacted the heat-sealing plates, were higher than those at the other positions of the plastic films, and the temperature of the LLDPE at the same position as that of the NY was lower than that of the NY. However, the temperatures on the NY surface at x=10~20mm after heat sealing was completed were approximately equal to those of the LLDPE at the same position. Similar results were obtained for the other heat-sealing conditions. Figure 14 shows the temperature distributions on the NY surface and in the LLDPE located in the center part of the thickness of the heat-sealed areas at positions P5 and P6, which corresponded to measurement positions P5 and P6 shown in Fig.6, as a function of time. The heat sealing was carried out at v=15m/min and T=148°C for a duration of 0.06s. First, the temperature of the NY surface rose to a high temperature, then it fell and was in agreement with the temperature of LLDPE, which rose gradually. Similar results were obtained for the other heat-sealing conditions. The temperatures of the heat-sealed areas immediately after heat sealing for the imperfect, best and foaming heat-sealing conditions were approximately 80, 100 and 120°C, respectively. These temperatures were approximately equal to those obtained by the experiments, and were lower, equal to and higher than the melting point of LLDPE, which was approximately 100°C, respectively. Figure 15 shows the comparison between temperatures experimentally and analytically obtained as a function of time at v=15m/min and T=148°C. In this figure, temperatures experimentally obtained at measurement position P4 were also plotted, because the analytical results, which were obtained immediately after heat sealing, were considered to correspond to those experimentally obtained at position P4 rather than positions P5 and P6. The analytical results shown in Fig.15 were in the case where there was no filling liquid while the experimental results were those in the case where there was filling liquid. Therefore, the analytical results were compared with those experimentally obtained in the case where there was no filling liquid in Fig.16. In these figures, t=0s was implied immediately after the heat-sealed films separated from the heat-sealing plates, and the approximated straight lines obtained using the least square were also plotted. Figure 15 indicated that the analytically obtained temperatures at position P4 at time in the range of 0.3 to 0.45s were in good agreement with those experimentally obtained, though the analytical results at position P4 at t=0s had approximately 5°C differences with the experimental ones. From Fig.16, the analytically obtained temperatures at position P4 at time in the range of 0 to 0.45s were in good agreement with those experimentally obtained. 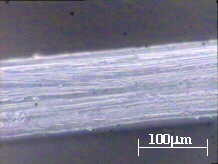 These results indicated that the filling liquid did not significantly affect the film temperatures at time in the range of 0.3 to 0.5s, for the range of which the temperatures of the film surface were observable with an infrared camera, though the filling liquid had a comparatively large influence on the temperatures of the film surface immediately after heat sealing. From the above results, finite-element analysis was found to be effective in estimating the temperature distributions on the surfaces of and inside the heat-sealed areas. Fig 15: Comparison between temperatures experimentally and analytically obtained (v=15m/min, T=148°C). Fig 16: Comparison between temperatures experimentally obtained in the case where there was no filling liquid and the analytical results in this case (v=15m/min, T=148°C). The temperatures on the surfaces of heat-sealed areas in liquid packaging bags made of laminated plastic films were measured and analyzed to investigate the effects of temperatures of heat-sealing plates and film feed rates on the heat-seal quality of the films in the heat-sealed areas. The experimental results revealed that the temperatures on the surfaces of the heat-sealed areas varied depending on the heat-sealing conditions: under the imperfect heat-sealing conditions, the temperatures were low when the heat sealing was difficult; under the best heat-sealing conditions, the temperature distributions were uniform; under the foaming heat-sealing conditions, spotted distributions of different temperatures were obtained. Moreover, the section observation of the heat-sealed areas revealed that non-heat-sealed parts were present, except in the case of the best heat-sealing conditions. The analytical results revealed that the temperatures of plastic films rose rapidly immediately after contact with heat-sealing plates which were the heat source, and became constant afterwards. Moreover, the temperatures in LLDPE varied depending on the heat-sealing conditions: under the imperfect heat-sealing conditions, the temperatures were below the melting point of LLDPE; under the best heat-sealing conditions, the temperatures were in the vicinity of the melting point; under the foaming heat-sealing conditions, the temperatures exceeded the melting point. The above-mentioned results revealed that the temperature distributions on the surfaces of the heat-sealed areas could be used to evaluate the heat-seal quality and the best heat-sealing temperature according to a film feed rate. Aoki, H., Shimamoto, A., Futase, K. and Kamata, Y., 2000, "Reinforcement Effect and Effective Length of Heat Seal in Liquid Packing Bag", J. Japanese Soc. NDI (in Japanese), 49-2:116-120. Futase, K., Shimamoto, A. and Takahashi, S., 1994a, "Impact Strength Test on a Heat Sealed Portion of Laminated Film for a Liquid-Filled Bag", Trans. Japan Soc. Mech. Eng., Ser. A (in Japanese), 60-580:2891-2896. Futase, K., Shimamoto, A. and Takahashi, S., 1994b, "Changes in Internal Pressure of Composite Film Packages by Their Drop Impact", Trans. Japan Soc. Mech. Eng., Ser. A (in Japanese), 60-580:215-220. 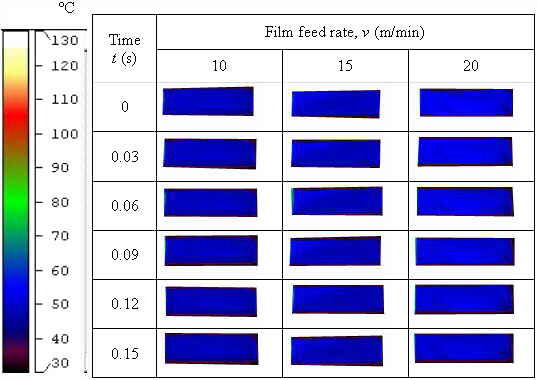 Futase, K., Shimamoto, A., Takahashi, S. and Aoki, H., 1996, "Tensile Strength of Heat-Sealing Part of Laminated Film Used for Liquid Pckage Bags: Effect of Material and Thickness Variations of Sealant Layers", J. Japanese Soc. NDI (in Japanese), 45-12:874-879. Umezaki, E., Kubota, Y., Shimamoto, A. and Futase, K., 1997, "Elastoplastic Finite-Element Analysis of Heat-Sealed Area in Laminated Plastic Film Used for Liquid Packaging Bags under Different Temperatures", Proc. 11th Int. Conf. on Composite Materials (ICCM-11) (Gold Coast, Australia), 4:547-558.